The first step that must be done by the prospective plaintiff is to file a civil suit by registering a lawsuit to the court. Registration of the lawsuit is submitted to the District Court based on its relative competence. 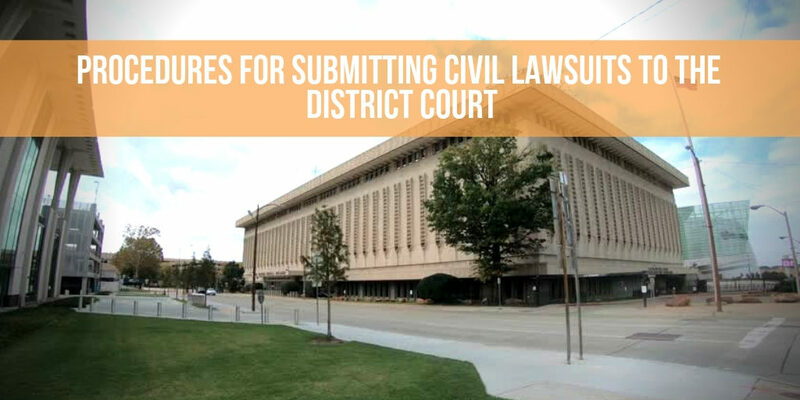 The relative competition in question is to determine the district court in the area which is authorized to handle the civil case that is intended to be filed. The way to determine the relative competency is, based on the defendant’s residence (the party sued in the case) or domiciled in the law designated in the agreement. The claim should be submitted in writing, signed by the Plaintiff or his attorney, and addressed to the Chairperson of the State Justice. Registration of this lawsuit can be done at the local District Court clerk’s office. After the registration of the lawsuit is received by the Registrar’s Office of the local District Court, then the Plaintiff is obliged to pay the court fee. The court fee paid at this stage is called the case fee, which is the final temporary fee that will be calculated after the decision of the court has been decided. Generally, after a court decision is issued, the losing party (between the Plaintiff and the Defendant) is the party who will bear the costs of the case. The cost of the case in question includes costs that need to be issued by the court in the process of examining the case, among others, the costs of courtesy, stamp duty, the summons of witnesses, local examinations, notifications, executions, and other costs required during the examination and trial process. If the down payment costs are not enough, the Plaintiff must add, and vice versa, if more then the remaining costs must be returned to the Plaintiff. There is an exception for the Plaintiff and/or Defendant who is unable to pay the court fees, so in the Civil Procedure Code, it also allows for litigation / free of charge. For litigation without fees, the Plaintiff can submit a request for permission to fight without charge by attaching it in his claim or in a separate letter. In addition to the Plaintiff, the Defendant can also submit it himself. This request is also accompanied by a certificate of incapacity from the sub-district head or village head where the party submitting the residence. Case registration is recording the claim on the Case Register Book to get the claim number so that it can be processed further, after making a payment in advance of the case fee. After obtaining a case number based on the serial number in the Case Register Book, the case will be submitted to the Chair of the District Court. The delegation must be done as accurately as possible so as not to violate the principles of a settlement of cases in a simple, fast, and low-cost manner, no later than 7 days from the date of registration. If you don’t have time to do this, you can contact Tulsa Warrants for help. After examining the files submitted to the Chair of the District Court, the Chairperson of the District Court will determine the Judge who will examine and decide the case no later than 7 days after the file is received. The panel of judges consists of at least 3 Judges, with the composition of one Chief Judge and 2 Member Judges. After the Panel of Judges who will examine and adjudicate the case is elected, the Panel of Judges then determines the trial day. The stipulation was stated in a decree no later than 7 days after the Panel of Judges received the case file. Then the Panel of Judges will summon the parties (Plaintiffs and Defendants) to be present on the determined trial day. Then the trial process will begin in accordance with the applicable Civil Procedure Code. With these six stages, it is easier for you to do the case process. So you don’t need to come first to the District Court without bringing definite results.